"You've got one job - make sure swim happy white people don't drown." Paramount released a third trailer for the summer comedy Baywatch, the movie, from director Seth Gordon. We've seen a few other trailers for this movie so far, and yet as much as I want to hate this movie, it actually looks good. Seriously, it looks laugh-out-loud funny, and weird, and self-aware, and full of odd but genuinely amusing comedic moments. Zac Efron and Dwayne Johnson star as two feuding, hunky Baywatch lifeguards; along with Alexandra Daddario, Priyanka Chopra, Pamela Anderson, Ilfenesh Hadera, Charlotte McKinney, Kelly Rohrbach, Hannibal Buress, plus of course David Hasselhoff. As another website said, this is the kind of movie you're going to pretend you don't want to see this summer, but will sneak into a showing and enjoy. You can still watch the first official trailer for Baywatch here, or the second, international trailer here. Baywatch follows devoted lifeguard Mitch Buchannon (Dwayne Johnson) as he butts heads with a brash new recruit (Zac Efron). Together, they uncover a local criminal plot that threatens the future of the Bay. Based on the original TV show that debuted in 1981. Baywatch is directed by American filmmaker Seth Gordon, of The King of Kong: A Fistful of Quarters, Four Christmases, Horrible Bosses, and Identity Thief previously. The screenplay is written by Damian Shannon and Mark Swift, with story credits for Robert Ben Garant, Thomas Lennon (of "Reno 911"), David Ronn & Jay Scherick. 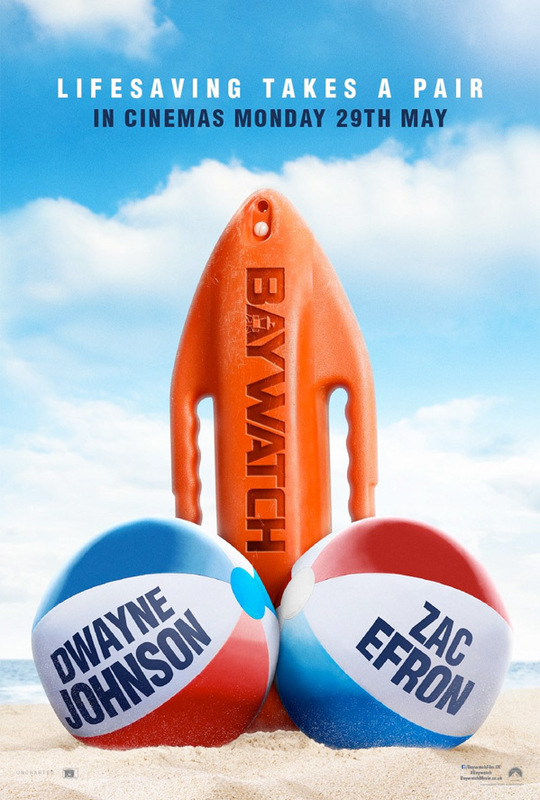 Paramount will release Seth Gordon's Baywatch in theaters everywhere starting May 26th, 2017 this summer. Who's ready to go to the beach?